Making the investment into gym membership is a great first step towards improving your health, fitness and quality of life. At TruSelf Sporting Club, we are here to help make your gym experience an easy, efficient and educated one. TruSelf Sporting Club features brand new equipment from the cardiovascular line, strength training equipment and free premium studio group exercise classes. TruSelf Sporting Club offers everything you need to be successful with your health. Our goal is too help educate all of members on fitness so that you’re not embarrassed to try a new class, piece of equipment or ask about a particular exercise. Why pay more for Yoga, Zumba, Total Body Resistance (TRX), and Spinning by itself? Here at TruSelf Sporting Club we put all those premium studio classes in for free included with your membership dues! Please see our Free Group Exercise Class schedule. Also at TruSelf Sporting Club, we continually re-invest back into our gym. Whether it’s adding new classes, strength training equipment, or simply out with the old and in with the new! Lastly, our Nationally Recognized TruSelf Sporting Club Fitness Professionals host a variety of seminars, new equipment demonstrations, and offer two complimentary assessments that come with your new membership. One time fifteen minute massage and a one hour stretching therapy session. We also have partnerships with University of San Diego (USD), San Diego State University (SDSU), University of California San Diego (UCSD) and the National Academy of Sports Medicine (NASM) in support of our Nationally Recognized TruSelf Training personal training department. 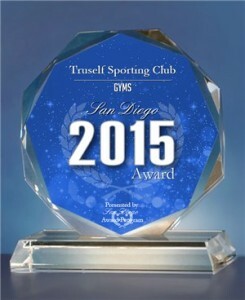 TruSelf Sporting Club is a 7,000 Sq. Ft facility and is located in the neighborhoods of Allied Gardens, Del Cerro and San Carlos of San Diego at 5125 Waring Rd, San Diego, Ca 92120. Our hours of operation are Monday-Thursday 5am-10pm, Friday 5a-9pm, Saturday 7am-6pm and Sunday 8am-5pm. We want to be your first choice when it comes time to choosing a gym. Make the investment with TruSelf Sporting Club and lets start our journey together. Proud Recipient of the 2015 Best New Gym in San Diego Award Winner and 2016 Winner of the Best Personal Trainers in San Diego!